Grits, Bacon, and my Favorite Things – Inspiration, Humor, and Food! I love this recipe because it is so easy, and looks and is super delicious! Much to my delight, I learned something wonderful about Krispy Kreme today. When I was a little girl, my parents would take me to the “donut factory” so we could watch the machine glaze the donuts with that wonderful recipe of yummy goodness. Thank you Krispy Kreme and the Salvation Army for helping our communities! I am looking SO forward to June! 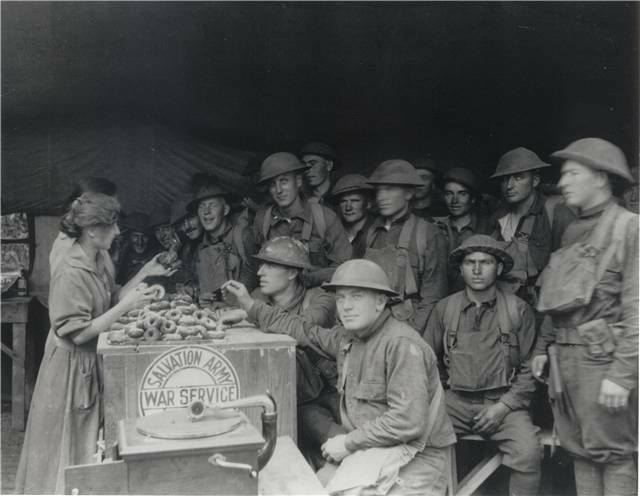 Held annually on the first Friday of June, Doughnut Day was established by The Salvation Army in 1938 to honor The Salvation Army’s “Doughnut Lassies” who served the treats to soldiers during World War I. The “Doughnut Lassies” are often credited with popularizing the doughnut in the United States when the troops returned home from war. Customers are encouraged to donate to The Salvation Army’s miniature Red Kettles stationed at the registers of participating Krispy Kreme locations. All donations will support the local communities where the donation was made. Approximately 250 Salvation Army volunteers provided assistance to American soldiers in France starting in 1917 during WWI. Last year, 30 million Americans received assistance from The Salvation Army’s 3,500 officers, 63,000 employees and 3.3 million volunteers. Krispy Kreme Doughnuts, Inc., is a global retailer of premium-quality sweet treats, including its signature Original Glazed® doughnut. Headquartered in Winston-Salem, N.C., the Company has offered the highest-quality doughnuts and great-tasting coffee since it was founded in 1937. Krispy Kreme Doughnuts is proud of its fundraising program, which for decades has helped nonprofit organizations raise millions of dollars in needed funds. Krispy Kreme Doughnuts can be found in approximately 12,000 grocery, convenience and mass merchant stores in the U.S. The Company has more than 1,000 retail shops in 26 countries. Connect with Krispy Kreme Doughnuts at www.KrispyKreme.com, or on one its many social media channels, including www.Facebook.com/KrispyKreme and www.Twitter.com/KrispyKreme. The Salvation Army, established in London in 1865, has been supporting those in need in His name without discrimination for more than 135 years in the United States. Approximately 30 million Americans receive assistance from The Salvation Army each year through a range of social services: food for the hungry, relief for disaster victims, assistance for the disabled, outreach to the elderly and ill, clothing and shelter to the homeless, and opportunities for underprivileged children. 82 cents of every dollar donated to The Salvation Army are used to support those services in 5,000 communities nationwide. The Salvation Army tracks the level of need across the country with the Human Needs Index (HumanNeedsIndex.org). For more information, go to salvationarmyusa.org or follow on Twitter @SalvationArmyUS. Posted on February 21, 2017 February 21, 2017 by Sandra's BlessingsPosted in Breakfast, Comfort, Food, Inspirational, UncategorizedTagged 1 Food Tips, @lifehopeverse, @RJonMac5 and Johnathan McCravy, A farm full of fun, Animals, Brooks family, Brooks Family Originally of Walton County and Johnathan McCravy, Cancer, Cancer Encouragement from Johnathan McCravy, Derek McCravy, Derek McCravy Johnathan McCravy Support Cancer Fundraiser, Derek McCravy Raleigh NC, Derrick McCravy Raleigh NC, Emma, Facebook Johnathan McCravy, Facebook with Johnathan McCravy and Derek McCravy and Sandra Brooks McCravy, Food, Greg McCravy, Greg McCravy Raleigh NC, gritsandbacon.com, Humor, Johnathan McCravy, Johnathan McCravy on Facebook, Johnathan McCravy Raleigh NC, Jonathan McCravy Raleigh NC, Krispy Kreme, Losing, McCravy Law Firm, McCravy Obituary, mylifeinscripture.com, Pinterest, Roey, Salvation Army, Sandi McCravy, Sandi McCravy Raleigh NC, Sandra Brooks McCravy Raleigh NC, Sandra's Blessings Pinterest, sandrabrooksmccravy.com, Sandy McCravy Raleigh NC, Supporters of the McCravy family with Johnathan McCravy and Derek McCravy, Twitter and Johnathan McCravy, Writer and Editor Derek McCravy.